LA Law was a 60 minute legal drama series on NBC about the business and personal lives of the attorneys and other staff at a prestigious Los Angeles law firm. Most of the action took place in the law offices and in the courtroom. Alan Rachins ............ Douglas Brackman, Jr. The auto license plate in the opening credits of each LA Law episode had the year that the current season would end in on it. For example, the 1986/1987 season's plate numbers read "1987". The car that held the plate was a Jaguar for the first seven seasons. In the eighth season, Arnie Becker began dreaming of owning a "Bentley Continental R". He got one as a gift in episode #153 titled, "How Much Is That Bentley in the Window?" and the plate was on the Bentley for the remainder of the series. On episode #95, "He's A Crowd", Abby Perkins (Michele Greene) and "C.J." Lamb (Amanda Donohoe) briefly but passionately kissed each other outside of a restaurant after finishing a difficult case. This was the first kiss between two women on a prime time TV series and was very contraversial at the time! McKenzie, Brackman, and Kuzak had a fourth major partner when LA Law premiered. His name was Chaney and he was found dead at his desk in the very first episode! When you watch LA Law, pay attention to the theme music. If it starts with a saxophone, the episode's plotline will be one of the more light-hearted ones. If the theme starts with stringed instruments, the episode will be more ominous. The co-creator of the LA Law TV show, "Steven Bocho", was also a co-creater of the series, "Hill Street Blues". That series was distinctive in that most of each episodes stories took place during one day. LA Law also used mostly one-day stories. LA Law's other co-creator, "Terry Louise Fisher", had been a deputy district attorney and an entertainment attorney before becoming a producer and a TV writer. Besides producing LA Law, she also produced and wrote for the series, "Cagney and Lacey" and "Hooperman", among others. Terry would often get nasty letters from Attorneys about how she characterized them or about how some legal aspect of the show was incorrect. Once in a moment of anger, she wrote a response that is rumored to never have been actually sent to anyone. It went, "Dear So-and-so: If I were a good lawyer, I'd still be practicing law. Instead, I'm stuck in Hollywood, making 10 times as much money. I hope you are as conscientious about your clients as you are about our show. Thank for your writing"! William M. Finkelstein took on the job of executive producer for LA Law's final season after his series titled, "Civil Wars" was canceled in early 1993. He brought two characters from that legal series to join the LA Law team (Eli Levinson played by Alan Rosenberg and Denise Ianello played by Debi Mazar). The LA Law TV show's cast was parodied on the October 1987 issue of Mad Magazine. 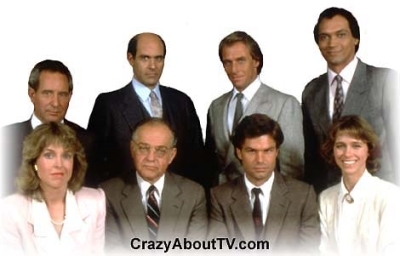 Steven Bochco liked it so much that he had the real cast get into the same positions as their parodies were in and took a photo to send to Mad Magazine. They printed that photo too in a future issue! LA Law: The Movie (5/12/2002) (aka: "LA Law: The Reunion" aka: "LA Law: Return to Justice"
Thank you for visiting our LA Law page!